Central Florida leaders joined the arts community to celebrate the topping off ceremony for phase 2 of the Dr. Phillips Center for the Performing Arts on March 21. The Steinmetz Hall and The Green Room complete the original three-theater vision for the Dr. Phillips Center and is set to open in spring 2020. 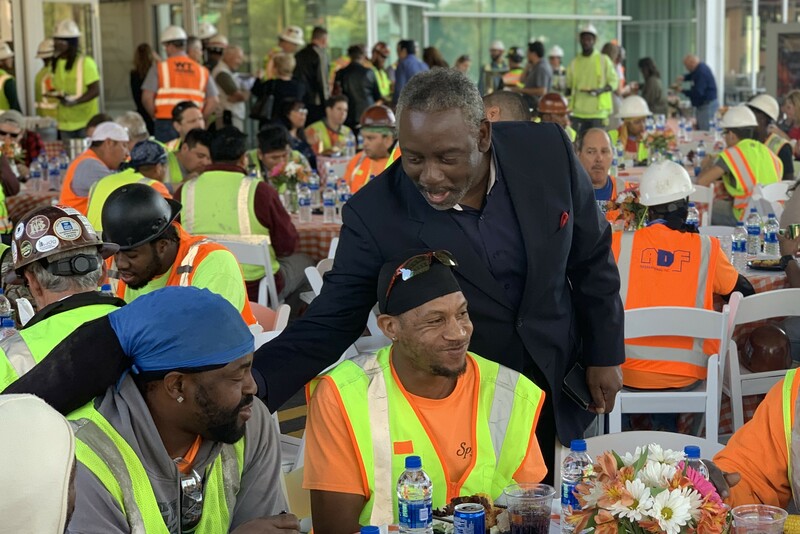 Attendees and construction workers from Whiting-Turner signed a ceremonial steel beam that will be used to top off the Steinmetz Hall’s theater box. Whiting-Turner, the construction manager for phase 2, broke ground in March 2017. The Steinmetz Hall is a state-of-the-art, 1,700-seat acoustic theater featuring a movable stage, floor and walls to provide custom floorplans for the Orlando Philharmonic Orchestra, Opera Orlando and other “unplugged” local, national and international performances. The Green Room is the Center’s new venue for private recordings, creative programming and other intimate events. Additionally, an expanded lobby for both spaces will be built, along with full kitchen facilities to serve both theaters. The Steinmetz Hall, named after Chuck and Margery Pabst Steinmetz, was partially funded by the two local philanthropists who committed $12 million toward the project in 2015. Orange County Government and its tourism industry partners have provided approximately $207 million of construction funds for the Center, backed by the Tourist Development Tax. Of that total, $143 million was used for construction of phase 2 and Steinmetz Hall. The Dr. Phillips Center opened in November 2014 with a vision of Arts for Every Life. Located in downtown Orlando, the Center has become a gathering place for creativity and discovery and a vibrant urban destination where artists, audiences and students come to experience, explore and learn. The two-block community destination features the 2,700-seat Walt Disney Theater, 300-seat Alexis & Jim Pugh Theater, Seneff Arts Plaza, Dr. Phillips Center AdventHealth School of the Arts, the DeVos Family Room, and other event rental spaces.